ReutersResidents of Berlin warned on Tuesday against making hasty judgments about asylum-seekers after a 23-year-old Pakistani man was arrested in connection with a truck attack on a Christmas market that killed 12 people. A Pakistani asylum-seeker arrested on suspicion of killing 12 people by mowing through a Berlin Christmas market in a truck may not be the attacker, and the real perpetrator could still be on the run, German police said on Tuesday. 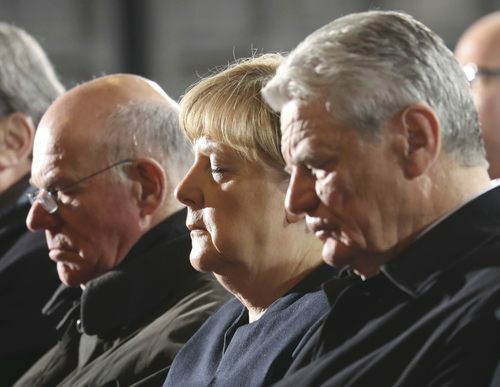 For months, Germany's Angela Merkel has looked like the one safe bet in European politics. 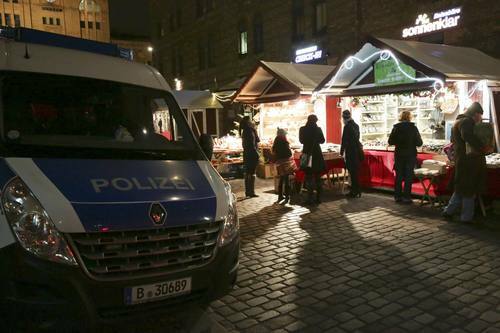 BERLIN, Dec 20 (Reuters) - Christmas markets in Berlin stayed shut on Tuesday as the city mourned the victims of the previous evening's truck rampage, while security measures were stepped up at similar events elsewhere in Germany and abroad. Germany’s interior ministry said other Christmas markets and large gatherings would not be called off, and appropriate steps to increase security should be decided at each location. Flags flew at half mast out of respect for those killed when a truck ploughed into a crowd at a market by Berlin's Kaiser Wilhelm memorial church on Monday. "No matter what we continue to learn about the exact background and motives of the perpetrators, we ...must not let them take away our freedom," Interior Minister Thomas de Maiziere said in a statement. Michael Krzyzniewski, security a expert for big public events, said safety measures were already in place at Christmas markets though some might want to review them. He said erecting protective concrete barriers was one option. In Dresden, the tourist information service said authorities had done that around the Striezelmarkt, one of Germany's oldest Christmas markets. "This has several serious downsides, for example it is then no longer possible for emergency vehicles to access the market in case someone has a heart attack," Krzyzniewski said. "We need to make sure that we don’t fall into panic and call for knee-jerk measures." The association of German fairground exhibitors recommended markets hold a minute's silence at 1700 GMT and refrain from playing music on Tuesday. 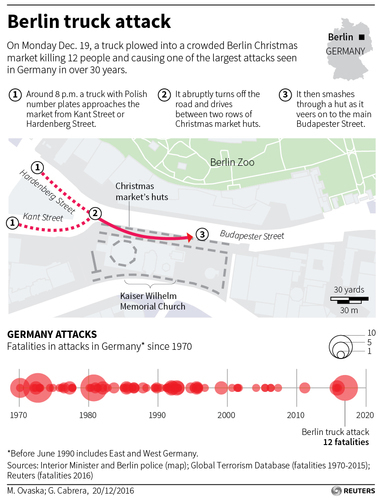 ReutersThe truck attack on a Christmas market in Berlin on Monday evening is the latest blow for Europe's tourism industry, hitting a city that had been attracting more and more visitors in recent years. U.S. President Barack Obama spoke with German Chancellor Angela Merkel on Monday night to offer condolences and U.S. help after a truck crashed into a Berlin Christmas market, killing 12 and wounding dozens, the White House said. Obama offered condolences for the "horrific apparent terrorist attack," it said in a statement on Tuesday. "The president reiterated the U.S. offer of assistance and underscored that no attack could sway our determination - and that of our German allies - to defeat terrorism in all of its forms," the statement said. UPDATE: Germany's chief federal prosecutor office says detained suspect in Berlin Christmas market attack has been released, says does not have enough evidence up to now to pursue case against the suspect. Cologne's main train station was briefly evacuated after a telephone bomb threat, but it turned out to be a false alarm, a German police spokesman said on Tuesday. A man arrested on suspicion of killing 12 people by mowing through a Berlin Christmas market in a truck has been released, the Chief Federal Prosecutor's Office said on Tuesday. It added it had been impossible to track the truck driver by eye-witnesses following the attack and that the investigation so far had not been able to prove that the suspect was in the truck's cab at the time of the attack. Islamic State claimed responsibility for an attack in which a truck ploughed into crowds in a Christmas market and killed 12 people. "The executor of the operation.. in Berlin is a soldier of the Islamic state and he executed the operation in response to calls to target nationals of the coalition countries," the militant group's AMAQ news agency said on Tuesday. 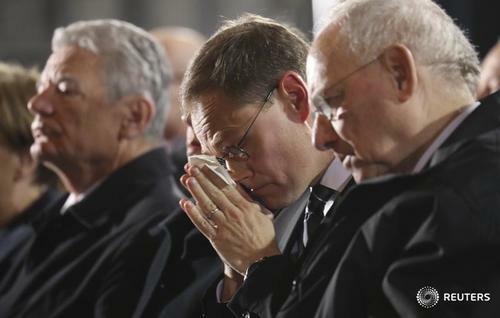 German Interior Minister Thomas de Maiziere said on Tuesday that investigators are following several leads on the Berlin Christmas market attack that killed 12 people. German authorities on Tuesday released a Pakistani asylum-seeker suspected of driving a truck into a Berlin Christmas market and killing 12 people due to a lack of evidence. 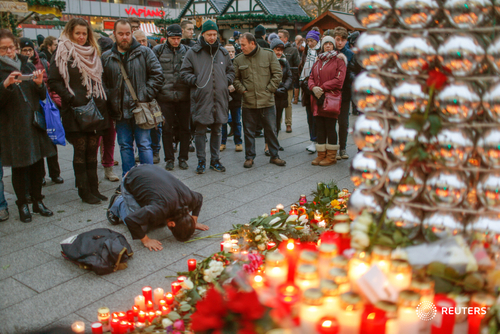 The German interior minister said the real perpetrator may still be on the run. Islamic State claimed responsibility the attack, saying the perpetrator was a "soldier" of the militant group. 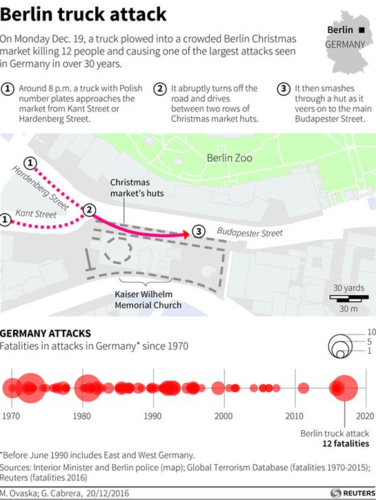 German police arrested another suspect in the early hours of Wednesday morning related to an attack on a Christmas market in Berlin that killed 12 people but later released him, German broadcaster rbb reported on Wednesday. On Tuesday evening police also released a Pakistani asylum-seeker who was arrested near the scene shortly after Monday's attack and authorities warned the attacker is on the run and may be armed. MORE: German police are looking for a Tunisian man after finding an identity document under the driver's seat of the truck which ploughed into a Christmas market on Monday evening, killing 12 people, Der Spiegel's online edition reported on Wednesday. Der Spiegel, which did not cite its sources, said the document was in the name of Anis A., born in Tataouine in 1992. The man is also believed to use false names. Reuters UKBritish police said they would temporarily close roads around Queen Elizabeth's London residence Buckingham Palace during a military ceremony on Wednesday, bringing forward plans to do so in response to a truck attack in Berlin. JUST IN: German newspaper says Tunisian suspect had been in contact with network of leading Islamist ideologist know as Abu Walaa, and had applied for asylum and received residency permit. Reuters UKGerman police are looking for a Tunisian man after finding an identity document under the driver's seat of the truck that ploughed into a Berlin Christmas market, killing 12 people, on Monday evening, security sources said. JUST IN: German state minister says suspect in Berlin attack appears to have used different names, declined to say whether suspect was on a watch list but security agencies have identified suspect as being in contact with Islamist network. MORE: German state minister says suspect appears to have arrived in Germany in July 2015, asylum application had been rejected. MORE: Germany offers up to 100,000- euro reward for info leading to capture of Tunisian suspect in Berlin attack. 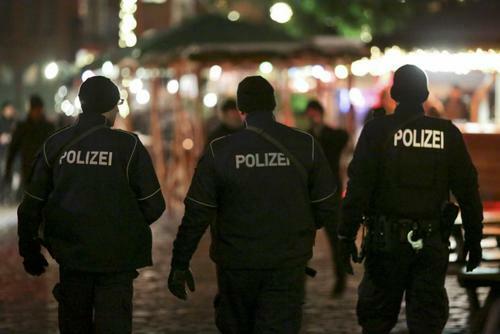 Police across Germany are supporting search for Tunisian suspect. 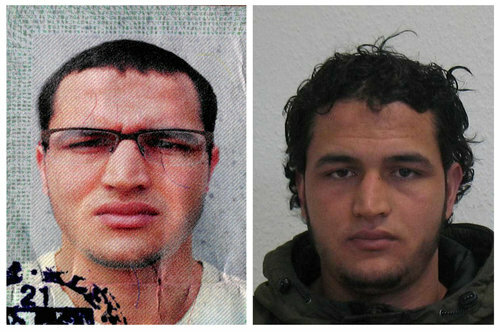 Anis Amri in a combination image released by German police. The Tunisian man suspected in the Berlin Christmas market attack left Tunisia seven years ago as an illegal immigrant and spent time in prison in Italy, his father and security sources told Tunisia's Radio Mosaique on Wednesday. German police are looking for an asylum-seeker from Tunisia after finding an identity document under the driver's seat of a truck that plowed into a Berlin Christmas market and killed 12 people, officials and security sources said on Wednesday. 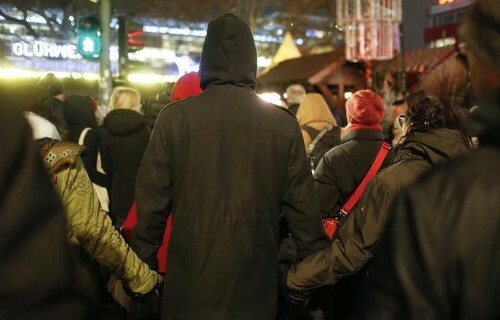 A group of people gather to sing 'We are the world' in front of the church in Berlin where a truck attack killed 12 people. Bundesliga clubs pay tribute to the victims of the truck attack on Berlin's Christmas market.